We are ESSI – E System Sales, Inc. Specialize in selling and installing new Phone Systems for Small Businesses all over the country since 2001 and we have many satisfied customers. In this industry a Small Business Phone System is considered as a system starting out with 3 phones that can expands up to 24 phones. In coming lines start as 4 lines in and can grow to 12 lines. 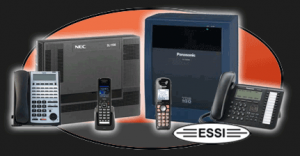 The NEC and Panasonic Systems can be configured as a basic phone system or an advanced phone system depending on the application and needs of your business. You only pay for the Small Business Phone System Features you need. What is unique about ESSI – E system Sales, Inc. all new Panasonic and NEC Phone Systems are programmed remotely for free with 60 days of updates. We also provide lifetime support and training to the original owner. We provide installation services as well as support for the do-it y0ur-selfer that confident they can wire the phone system them selves. You can expect either professional installation services or support for self installers that want to install the phone system them selves. Once your new phone system is installed we provide free remote programming services for systems we sell with 60 days of updates to doubly make sure your new Telephone System is programmed and working the way you want it to work.